There are many potential threats to drinking water. The Clean Water Act, 2006 identifies specific activities that pose a risk of contamination. The task of the CTC Source Protection Committee is to ensure that each of the existing or potential threats to municipal sources of drinking water in the CTC Source Protection Region are eliminated. 1. The establishment, operation or maintenance of a waste disposal site within the meaning of Part V of the Environmental Protection Act. 10, 11. The application, handling and storage of Pesticide. 17. Handling and storage of Organic Solvents. 2. The establishment, operation or maintenance of a system that collects, stores, transmits, treats or disposes of sewage. 12, 13. The application, handling and storage of Road Salt. 18. Runoff management: chemicals to de-ice aircraft..
3, 4, 5. The application, handling and storage of Agricultural Source Material (ASM). 14. Storage of Snow. 19. Activity that takes from, but does not return water to the same aquifer or surface water body. 6, 7. The application, handling and storage of Non-Agricultural Source Material (NASM). 15. Handling and storage of fuel. 20. Activity that reduces the Recharge of an aquifer. 8, 9. The application, handling and storage of Fertilizer. 16. Handling and storage of Dense Non Aqueous Phase Liquids (DNAPL). 21. Use of land as livestock for grazing, pasturing, outdoor confinement or farm animal yard. You can learn more about specific threats HERE. 1. 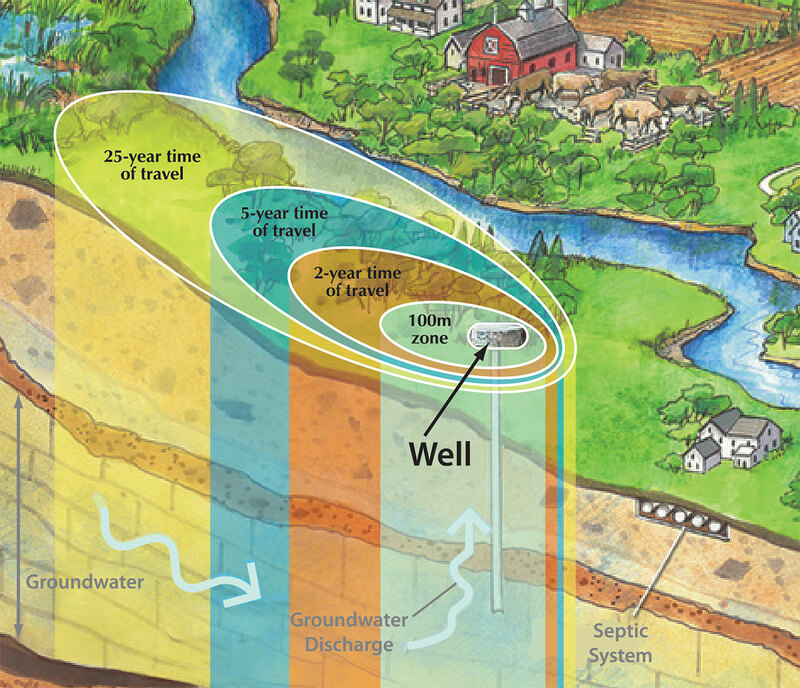 Wellhead Protection Areas (WHPAs): areas where water travels through the ground to a municipal well. 2. 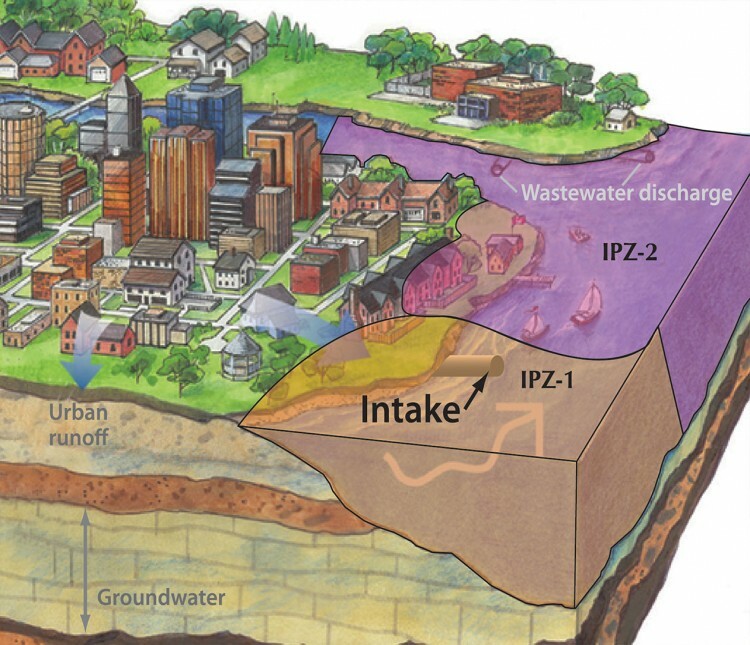 Intake Protection Zones (IPZs): areas around municipal surface water intakes. Every area that falls into one of these categories receives a Vulnerability Score, based on the risk of contamination. Generally speaking, the closer to the well or intake, the higher the score. The Ministry of the Environment and Climate Change has developed a Source Water Protection Information Atlas. This interactive mapping tool enables enables homeowners, developers, farm owners and municipalities to search any location to determine if it lies within a vulnerable area. The Clean Water Act, 2006 identifies 21 different activities that represent existing or potential threats to drinking water. These include livestock grazing or pasturing, the operation of waste disposal sites and septic systems, the handling and storage of fuel, pesticides and commercial fertilizers, and the use of road salt and aircraft de-icing chemicals. You can see the full list here. Each activity receives a Hazard Score based on its potential to contaminate drinking water. We calculate threat levels by multiplying the Vulnerability Score of the area and the Hazard Score of the activity. If the resulting number is higher than 80, the activity is or could be a “significant threat” and must be addressed by the Source Protection Plan. You can learn more about potential threats by downloading our Drinking Water Assessment guide.